Nepal and Bangladesh have agreed to build cross-border transmission lines between the two countries, to supply electricity generated in Nepal to Bangladesh. The Simrutu River Small Hydropower Project, a micro-hydropower plant developed under the SASEC Program, is nearing completion in Rukum District, Nepal. The power plant will produce 200 kilowatts of electricity for rural communities and will be the largest hydropower project in the district once completed. The project is partially financed by the Asian Development Bank. PTC India Limited and the Bangladesh Power Development Board signed two new power purchase agreements on 9 October 2018 to add 200 megawatts of power import from India to Bangladesh. The contracts, worth $1.8 billion, will be supplied to Bangladesh on a short- and long-term basis. Mr. Dharmendra Pradhan, Minister for Petroleum and Natural Gas, Government of India, and Mr. Matrika Prasad Yadav, Minister for Industry, Commerce and Supply, Government of Nepal, held a bilateral meeting to discuss strengthening of energy and economic ties between the two countries. Both ministers agreed to explore potential pipelines for LPG and LNG to supply fertilizer plants and industries in Nepal. The 15th Meeting of the Bangladesh-India Joint Steering Committee on Power Sector reviewed the existing cooperation between the two countries in the energy sector. Bangladesh plans to import an additional 340 megawatt electricity through the Surjomoni-Cumilla North Link, under government-to-government modality. The meeting also reviewed the proposal to set up a power transmission line that will enable Bangladesh to import electricity from Bhutan and Nepal through India. Bangladesh Prime Minister Sheikh Hasina and Nepal Prime Minister KP Sharma Oli agreed to take Bangladesh-Nepal cooperation in the energy sector to the next level. Mr. Ihsanul Karim, Bangladesh Press Secretary, reported that the two Prime Ministers discussed enhancing cooperation in the power sector, and agreed on the need to sign a memorandum of understanding to enable power trade. India’s GMR Upper Karnali Hydropower Ltd. is set to sign a power purchase agreement with the Bangladesh government to export electricity to be generated by the Upper Karnali Hydropower Project in Nepal. The agreement will serve as a guiding framework for Nepal for exporting surplus electricity to Bangladesh. Bangladesh’s Executive Committee of the National Economic Council has approved a project to install a high-voltage direct-current back-to-back substation at Comilla in Bangladesh for importing 500 megawatts of electricity from Tripura, India. The Government of India signed an agreement to build two liquefied natural gas (LNG) terminals in Colombo, Sri Lanka, in collaboration with the Government of Japan. These were approved by the Government of Sri Lanka, along with an LNG project by the People's Republic of China. In total, the three LNG power plants will generate up to 1,400 megawatts. Dr. Yongping Zhai, Technical Advisor (Energy), Sustainable Development and Climate Change Department, Asian Development Bank (ADB), and Mr. David Elzinga, Senior Energy Specialist, ADB, advised the Government of Sri Lanka to keep their options open in securing the country's energy future. Reiterating ADB's support for Sri Lanka's energy security, Dr. Zhai urged the country to opt for renewables over coal to fast-track its commitment to the Paris agreement. The Government of Bangladesh's Cabinet Committee on Purchase approved a proposal to import 500 megawatts of electricity from India from June 2018 to May 2033 to help meet the country's energy demand. The Committee also cleared a proposal appointing Texmaco Rail and Engineering from India to build the dual gauge rail line from Akhaura to Agartala. Bangladesh's 'Look East Policy' and Thailand's 'Look West Policy' could be synchronized to create new trade and economic connectivity corridors, according to Thailand Prime Minister Prayut Chan-o-chaon during a meeting with Bangladesh Foreign Minister AH Mahmood Ali. They discussed a range of bilateral cooperation, including shipping, trade, energy, and those under BIMSTEC. As Bangladesh's economy expands, its demand for energy also increases. The Bangladesh National Conservation Strategy projects that by 2030, the country's electricity demand will reach around 34,000 megawatts. In this commentary, Mr. Promod Rijal, senior economist at the Institute for Integrated Development Studies in Nepal, explains how transboundary energy trade between Bangladesh and Nepal through India will help Bangladesh meet its energy needs. India will supply an additional 300 megawatts (MW) to Bangladesh through the state-run NTPC Ltd. This additional energy export will begin once the 500 MW high voltage direct current Bangladesh-India inter-connection is commissioned. Rapid economic growth and increasing populations pose challenges to the South Asian region’s energy security. Increasing energy cooperation among South Asian countries will help ensure access to affordable, reliable, and sustainable energy for the entire region. The Government of Bhutan is moving forward with Detailed Project Reports for pipeline hydropower projects in the country, including hydropower joint ventures with the Government of India. Bhutan aims to generate another 5,178 megawatts by 2025 from these pipeline projects, including the 1,125 MW Dorjilung project, 2,560 MW Sunkosh project, and 2,640 MW Kuri Gongri project. The SASEC Program ended 2017 on a high note, having launched the SASEC Vision, welcomed Myanmar as a full member of SASEC, invested almost $1 billion in three new projects during the year, and seen total program investment rise to $10.74 billion for 49 loan/grant projects. The SASEC Vision paved the way in 2017 for strengthened partnership and economic cooperation between the countries of South Asia and Southeast Asia, by leveraging opportunities and synergies found in natural resources. In her keynote address at the dialogue on BiMSTEC at 20—Priorities for the Future, Ms. Grace Asirwatham, State Secretary, Ministry of Foreign Affairs, Sri Lanka, reflects on the prospects for connectivity and prosperity among BIMSTEC member countries and explores the organization's priorities, including trade, transport, energy, and climate change. The power purchase agreement between the Nepal Electricity Authority and the NTPC Vidyut Vyapar Nigam of India was extended by three months, from 1 January to end of March 2018. This allows Nepal to import up to 160 megawatts of electricity through the Dhalkebar-Muzaffarpur cross-border transmission. An ADB-funded project is upgrading power lines and substations in 49 locations in Nepal to enhance the country’s electricity distribution system. The $191 million SASEC Power System Expansion Project aims to increase the load-bearing capacity of transmission lines in Nepal. In his keynote address at the ADB Regional Cooperation and Integration Week, ADB President Takehiko Nakao stated that regional cooperation is critical to securing Asia’s economic future. He noted ADB’s continued commitment to support regional cooperation as a means to reduce inequality and overcome infrastructure gaps, and cited specific SASEC projects as effective examples. The ADB Regional Cooperation and Integration Week was held on 27-29 November 2017, in Manila, Philippines. At the Second Ministerial Conference on Regional Cooperation and Integration (RECI) organized by UNESCAP and ADB, government ministers and participants committed to support the implementation of the agenda for the Sustainable Development Goals (SDGs). The ministers said RECI should be consistent with the SDGs in contributing to social progress and environmental sustainability. Experts at the launching of UNCTAD’s The Least Developed Countries Report 2017 urged the Government of Bangladesh to strengthen the country’s electrical system and address electricity governance and finance to ensure affordable power supply to homes and businesses. Despite significant improvements over the past decade, challenges remain, according to the Report. Nepal has decided to join the Bay of Bengal Initiative for Multi-Sectoral Technical and Economic Cooperation (BIMSTEC) grid interconnection, a move meant to help facilitate trade in electricity and take full advantage of available energy sources. Nepal is expected to sign an MOU to join the grid interconnection at the Third BIMSTEC Energy Ministers' Meeting. The Second Meeting of the SAARC Council of Experts of Energy Regulators (CEERE) on 24-25 October 2017 discussed a road map for implementation of the SAARC Framework Agreement on Energy Cooperation (Electricity), issues on power trade, including harmonization of grid code, operating procedures for cross-border power trade, and harmonization of electricity laws. Ms. Sushma Swaraj, Minister of External Affairs, India, and Mr. Abul Hassan Mahmood Ali, Foreign Minister, Bangladesh, co-chaired the Fourth India-Bangladesh Joint Consultative Commission (JCC) Meeting, reviewing progress on key initiatives and decisions in areas including trade and investment, security, connectivity, border management, power, energy, shipping, and people-to-people exchange. Mr. Abul Maal A. Muhith, Finance Minister, Bangladesh, and Mr. Arun Jaitley, Finance Minister, India, signed the Third Line of Credit (LoC) from India to Bangladesh worth $4.5 billion, to be used for implementation of projects in connectivity. Mr. Jaitley lauded the outstanding relations between the two neighbors after a meeting with Mr. Muhith. Mr. S. Jaishankar, Foreign Secretary, India, met with Bhutan top leaders to discuss trade and economic ties, energy cooperation, and the implementation of India-assisted projects in Bhutan. The 13th Joint Steering Committee Meeting between Bangladesh and India, held on 27-28 September 2017 in New Delhi, India, reviewed Bangladesh-India power sector cooperation, and explored new areas and opportunities, including the possible 840 megawatt (MW) additional electricity import from India to Bangladesh, and planned Bangladesh hydropower imports from Nepal and Bhutan. The 18th session of the Bay of Bengal Initiative for Multi-Sectoral Technical and Economic Cooperation (BIMSTEC) Senior Officials' Meeting and the 15th BIMSTEC Ministerial Meeting stressed the importance of cooperation in energy, technology, trade, and transport, through a revitalized, more integrated, and stronger BIMSTEC process. The Joint Statement underscored the need to finalize the BIMSTEC Free Trade Area Agreement. The Government of Bangladesh and India's GMR Upper Karnali Hydropower Ltd. are now preparing to sign a power purchase agreement. GMR will be exporting 300 to 500 megawatts (MW) of energy generated by the Upper Karnali Hydroelectric Project in Nepal via India. The International Trade Centre's Trade Map reports an increase in intraregional trade in the Bangladesh-Bhutan-India-Nepal (BBIN) subregion in 2016, from $21.65 billion in 2015 to $23.52 billion. The ratio of BBIN intraregional trade to world trade went up from 2.98% in 2015 to 3.34% in 2016. The Asia Foundation, in collaboration with the Confederation of Indian Industry, is preparing a study on energy trade in the Bangladesh-Bhutan-India-Nepal subregion, examining how market forces, networks, and stakeholders interact. In this commentary, Mr. Aditya Valiathan Pillai, program officer of the Asia Foundation in India, discusses the creation of an energy market in South Asia and the growing importance of regional electricity trade in helping mitigate carbon emissions. Economic transformations have accelerated regional cooperation and integration in Asia. In this ADB blog post, Mr. Cuong Minh Nguyen, Principal Regional Integration Specialist, Southeast Asia Department, ADB, discusses six paradigm shifts that are reshaping economic prospects in Southeast Asia, South Asia, and other parts of the region. It also highlights the need for governments to work together to build a socially inclusive, environmentally friendly, and economically sustainable region. India's Ministry of Power is preparing a set of guidelines for cross-border trade of electricity, with draft regulations from the Central Electricity Regulatory Commission. This will regulate cross-border energy trade between India and Bangladesh, Bhutan, Myanmar, and Nepal, by creating a uniform framework. SASEC Powering Asia in the 21st Century defines the SASEC Vision, setting the SASEC partnership on a path to help transform the subregion into Asia's powerhouse in the 21st century. The Vision steps up cooperation among SASEC member countries, guiding them how to transform transport corridors into industrial and economic corridors, and promoting sustainable economic growth by generating synergies among SASEC member countries. India's Union Cabinet, chaired by Prime Minister Narendra Modi, approved the ratification of the MOU for the Establishment of the BIMSTEC Grid Interconnection. The MOU is expected to be signed at the next BIMSTEC Energy Minsters' Meeting and provides a broad framework for energy trade among BIMSTEC member countries. ADB has allocated $843.8 million for Nepal for 2017-2019. An additional $356 million can be made available over the period for projects contributing to regional cooperation and integration and reduction of disaster risks, provided that Nepal continues to improve performance of its ongoing projects, according to Mr. Wencai Zhang, Vice President, ADB. The Governments of India and Nepal discussed how to bring transmission line projects—the Dhalkebar (Nepal)-Muzaffarpur (India) transmission line, Raxaul (India)-Parwanipur (Nepal) transmission line, and Kataiya (India)-Kushaha (Nepal) transmission line—into operation. They agreed to increase the Dhalkebar-Muzaffarpur transmission line to 220 kVa capacity in May 2017, and begin electricity import through the Raxaul-Parwanipur and Kataiya-Kushaha transmission line. Hydropower cooperation among Bangladesh, Bhutan, India, and Nepal could be a viable option for addressing growing power needs in the region, said Mr. Ainun Nishat, Professor Emeritus, Centre for Climate Change and Environmental Research, Brac University, Bangladesh. Nepal’s hydropower potential stands at 83,000 megawatts (MW), while Bhutan’s is at 40,000 MW and northeast India’s at 60,000 MW. The second meeting of the Nepal-India Oversight Mechanism, held on 30 January 2017 in Kathmandu, Nepal, reviewed progress of India-funded economic and development projects in Nepal, and agreed to expedite implementation of these projects for timely completion. Projects discussed included cross-border railways, integrated check posts, and cross-border transmission lines. The Integrated Research and Action for Development initiative has launched the analytical study “Economic Benefits from Nepal-India Electricity Trade,” confirming that a large economically feasible electricity export potential exists. Electricity trade can help boost Nepal's economy and improve the well-being of its people, and offers India an affordable and convenient renewable resource to meet demand. Nepal has upgraded the Thame Khola Small Hydropower Plant in Namche VDC, Solukhumbu District, raising the plant’s capacity from 630 kilowatts (kW) to 930 kW. India provided assistance of $54,500 for the upgrade. The facility supplies power to the upper Khumbu valley, including 18 villages of Khumjung and Namche VDC. Least Developed Countries (LDCs) comprise around 880 million people yet account for less than 2% of the world gross domestic product. South Asian countries can accelerate economic development and graduate from the LDC category by working with each other. The economic future of their people could change radically through collaboration between the countries and lift millions of people out of poverty. Nepal’s hydropower potential could be realized with an efficient technological base, entrepreneurial vision, a coordinated power trading approach, and sustained investment commitment. Hydropower development would bring economic, social, and environmental benefits in Nepal and the rest of the South Asian region. In this speech delivered at the Power Summit, Nepal Prime Minister Pushpa Kamal Dahal vowed to support domestic and foreign investors through a policy encouraging investment. The Asian Development Bank (ADB) has approved an additional $20 million for the SASEC Power System Expansion Project in Nepal, to be provided by the ADB Strategic Climate Fund. This additional financing will support installation of utility-scale solar photovoltaic systems by 2018. The Government of Nepal is also providing complementary funding of $24.5 million. India's Ministry of Power has issued Guidelines on Cross-Border Trade of Electricity, with the aim of facilitating cross-border trade of electricity between India and its neighboring countries; promoting transparency, consistency and predictability in regulatory approaches across jurisdictions and minimizing perceptions of regulatory risk; and developing reliable grid operation and transmission of electricity across borders. The SASEC project portfolio has surpassed the $9 billion mark with the December 2016 approval of Nepal’s SASEC Roads Improvement Project, worth $256.5 million. There are now 44 SASEC investment projects worth a cumulative $9.13 billion. During 2016, seven projects have been approved for a total of $2.37 billion. Bangladesh Foreign Minister A.H. Mahmood Ali highlighted the potential joint development of hydropower projects between Bangladesh and Bhutan during discussions with Bhutan Ambassador to Bangladesh Sonam Tobden Rabgye. In a meeting with the Confederation of Indian Industry (CII), Mr. Kazi M. Azul Islam, Chairman, Bangladesh Investment Development Authority, promised CII delegates that Bangladesh will work toward improving the country’s ‘Ease of Doing Business’ to encourage more investors from India. Bangladesh has set a five-year target to improve its ease of doing business. 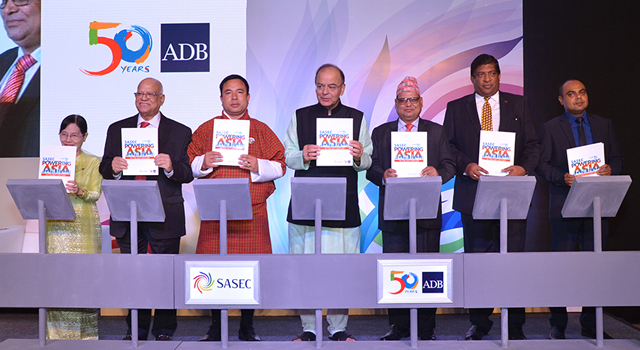 The SASEC Operational Plan, which aligns and brings together all SASEC sectoral strategies, was launched in Kathmandu, Nepal. With 37 of the 200 planned projects set to be implemented in Nepal, the Government’s policy reform efforts to integrate with global markets is set to receive a significant boost. A high-level panel formed by the Governments of India and Nepal will work to address bottlenecks in infrastructure projects in Nepal funded by the Government of India—including hydropower projects, roads and railways—to ensure their timely completion. Mr. S. Jaishankar, Foreign Secretary, Ministry of External Affairs, India, called on Sri Lanka President Maithripala Sirisena to discuss potential partnerships between India and Sri Lanka in sectors including energy, infrastructure, and transport, and Sri Lanka Prime Minister Ranil Wickremesinghe to further discuss boosting bilateral trade and investment. The Governments of Bangladesh and Nepal have agreed to undertake joint investments in hydropower plants in Nepal, to generate electricity, including energy exports to Bangladesh. The two countries signed a deal to set up two hydropower plants capable of generating 1,500 megawatts. A 'Foreign Direct Investment (FDI) in Hydropower' forum in Kathmandu, Nepal stressed the need for more FDI in hydropower projects. According to Nepal Minister for Energy Janardan Sharma, Nepal needs more investment to be able to fully harness its hydropower capacity. The Power Trade Agreement signed by Nepal and India promises a huge market for Nepal's hydroelectricity. The Parliament of Nepal has endorsed the South Asian Association for Regional Cooperation (SAARC) Framework Agreement for Energy Cooperation, enabling the 8 SAARC member countries to conduct cross-border electricity trade. Under the Agreement, SAARC member states have agreed to provide non-discriminatory access to the regional transmission grids. Preparations to sign a power trade agreement between the Governments of Nepal and Bangladesh are underway, with the Energy Ministry of Nepal finalizing a draft memorandum of understanding on Nepal-Bangladesh energy cooperation. The draft outlines protocols for conducting energy trade between the two countries, in line with the South Asian Association for Regional Cooperation Framework Agreement for Energy Cooperation. The 24th meeting of the Investment Board Nepal (IBN) endorsed the "National Energy Demand and Supply Study," which was undertaken to address the issue of latent demand and come up with a more realistic demand forecast for energy. According to the study, Nepal's energy demand will reach around 10,000 megawatts by 2030. Electricity will also have a dominant share of energy in Nepali households. The Governments of Bangladesh and India are working on plans to expand the regional energy market by doubling the capacities of cross-border power transmission interconnections, and setting up a third cross-border energy grid. Regional trade in power could save India from having to invest in 35,000 megawatts in coal-fire facilities, estimated at $26 billion, over the next 25 years. Through energy trade with Afghanistan, Bhutan, and Nepal, India could benefit from reduced fuel costs and a 6.5% reduction in greenhouse gas emissions. The 2-day Nepal Power Investment Summit 2016 concluded with a declaration that Nepal needs $20 billion to develop 10,000 megawatts through on-grid hydropower projects in the next decade. It also noted investment needs of $5 billion for high-voltage transmission projects and other opportunities in the country's hydropower sector. Nepal has forwarded a proposal to set up an India-Nepal energy bank that would help both countries address the problem of power shortage at a meeting of the India-Nepal Joint Standing Committee. The energy bank would enable Nepal to export electricity to India during summer and import electricity from India during winter. Bangladesh is reviewing targets for its renewable energy program to reduce the country’s greenhouse gas emissions. Mr. Nasrul Hamid, State Minister for Power, Energy, and Mineral Resources of Bangladesh said the Sustainable and Renewable Energy Development Authority aims to increase share of energy coming from renewable resources. The India-Myanmar Business Conclave met recently as part of a push for stronger economic ties between the two countries. At a conference on 18-20 May in Yangon, Myanmar, business leaders discussed partnerships as well as opportunities for future cooperation. Ms. Nirmala Sitharaman, Minister of State for Commerce & Industry of India, spoke on forging partnerships, highlighting India’s opening of 96.4% of tariff lines at zero duty for Myanmar. Bangladesh Foreign Minister Abul Hassan Mahmood Ali and Bhutan Foreign Minister Damcho Dorji discussed hydropower in a meeting in Thimphu, Bhutan: Bangladesh plans to invest in the 1,125 megawatt Dorjilung hydropower project. Trilateral cooperation among Bangladesh, Bhutan, and India would enable Bangladesh's investment in Bhutan's hydropower sector. 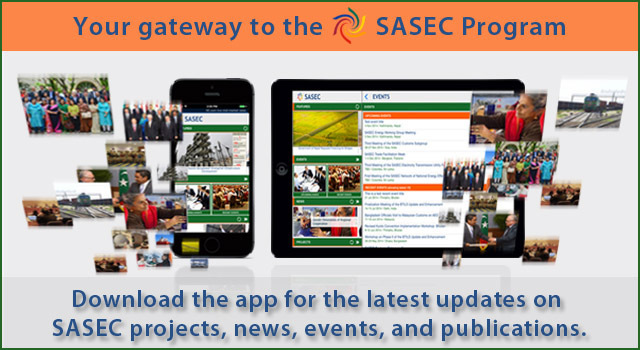 Version 2.0 of the SASEC Program Mobile App is now available for download. With improved user interface and layout, updated offline data, faster caching, and smaller app size, the updated SASEC Program Mobile App is lighter, quicker, and more user friendly. The contract for civil and hydro-mechanical works of the Nikachhu Hydro Energy Project has been awarded to the Hindustan Construction Company Limited, in an international bidding held by Tangsibji Hydro Energy Limited. Works under the commissioned contract, worth around $69 million, are scheduled to start as early as July 2016. The 118 megawatt Nikachhu hydropower plant aims to become another model hydropower development in Bhutan. Bangladesh plans to import 2,000 megawatts of electricity from India in the coming years, according to Bangladesh State Minister for Power, Energy and Mineral Resources Nasrul Hamid in his address at the 'Power Market Development in India: Key Lessons Learnt' workshop. He highlighted the country's ongoing regional power trade with India and plans for its expansion, and urged the Government of India to step forward in the planned hydropower project with Bhutan. The Nepal Electricity Authority (NEA) and the Asian Development Bank (ADB) will create a 'central-level safeguard unit' to focus on preparation of the ADB-supported SASEC Power System Expansion Project in Nepal. 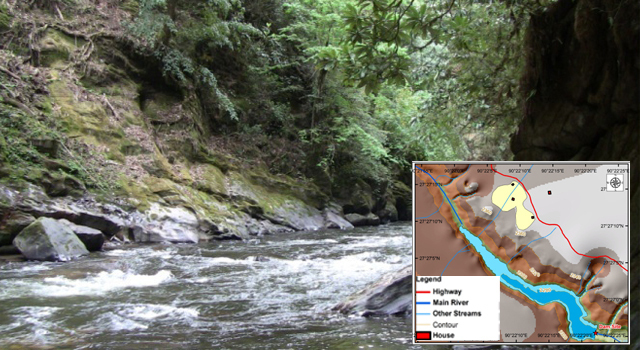 The unit will comprise a team of professionals and experts, who will coordinate project issues at the local level, including land acquisition, forest clearance, and right of way. The Jigme Wangchuck Power Training Institute in Gelephu, Bhutan is preparing to meet the human resource requirements of the country’s hydropower sector in the next four years. According to estimates by the Druk Green Power Corporation and Bhutan Power Corporation, the country’s hydropower sector will need at least 6,500 people to achieve its vision of generating 10,000 megawatts by 2020. Mr. Pradeep Kumar Pujari, Secretary, Ministry of Power, India, ensured continuous demand for hydropower in the Indian grid, during his visit to Bhutan to review ongoing joint hydropower ventures. The Government of India plans to triple its power generation capacity to 800 gigawatts by 2030, using renewable energy sources. Mr. Wencai Zhang, Vice-President, Asian Development Bank, discussed ways to accelerate Nepal's economic structural transformation with policy makers, scholars, and Government officials in “Envisioning Nepal 2030”, an international seminar jointly organized by the National Planning Commission and ADB. In his address, he discussed how regional cooperation and integration could turn Nepal from a landlocked to a land-connected country. Bangladesh Prime Minister Sheikh Hasina and India Prime Minister Narendra Modi participated in the inauguration of an additional 100 megawatt electricity supply from India's Tripura state to Bangladesh's Comilla state, and the leasing of 10 GBPS of internet bandwidth from Bangladesh to India's Agartala state on 23 March 2016. Both Prime Ministers lauded Bangladesh-India cooperation. India Foreign Secretary S. Jaishankar discussed initiatives being pursued by India in line with its 'neighborhood first' policy, in his address at the 42nd Standing Committee Meeting of SAARC. He also emphasized the need to implement the South Asia Economic Union, and sign the SAARC Motor Vehicles Agreement and SAARC Railways Agreement. Mr. Nasrul Hamid, Bangladesh State Minister for Power and Energy, discussed the possibility of enhancing the scope of Bangladesh-India cross-border energy transmission to include Bhutan in a meeting with Indian High Commissioner in Dhaka Harsh Vardhan Shringla. Bangladesh is mulling a $1 billion investment in Bhutan's hydropower industry, and is reviewing a draft MoU for possible electricity imports from Bhutan. The need to ramp up cooperation in energy between Bangladesh and Nepal was discussed by Bangladesh Minister for Information Hasanul Haq Inu at an interaction organized by the Nepal Reporters’ Club. According to the Minister, Bangladesh has already forwarded a proposal for transmission of energy from Nepal. The Second Meeting of the SAARC Energy Regulators agreed to address regulatory barriers through a Regional Regulatory Body, which will work toward harmonizing legal, policy, and regulatory frameworks to promote wider availability of electricity and boost cross-border trade in the region. The 9th Session of the India-Sri Lanka Joint Commission discussed strengthening India-Sri Lanka cooperation in areas including energy and trade. The two countries are also preparing to open negotiations on the Economic and Technology Cooperation Agreement. Further possible collaboration in railway development and renewable energy was also bookmarked by the Joint Commission. A 2-day meeting of the Joint Working Committee and Joint Steering Committee on India-Nepal Cooperation in the Power Sector discussed the implementation of the power trade agreement (PTA) signed in September 2014. The Meeting agreed that India will supply Nepal with 300 megawatt of electricity in the next 18 months, and reviewed plans for long-term energy trade, including the proposed 6 cross-border power corridors. The third meeting of the Joint Working Group on Subregional Cooperation between Bangladesh, Bhutan, India and Nepal (BBIN) on Connectivity and Transit and Water Resources Management and Power/Hydropower deliberated new initiatives for deepening cooperation. Discussion centered around progress made under the BBIN Motor Vehicle Agreement and the proposed BBIN Rail Agreement. Construction was completed in December 2015 of the 47-kilometer transmission line from India's western Tripura to Bangladesh's southern Comilla and is ready to start supplying 100 megawatt of power from India to Bangladesh. In January 2016, a meeting between Bangladesh and India fixed the tariff for the electricity supply and formal approval will start the flow of power. Strengthening of regional cooperation and integration (RCI) remains a priority of the Asian Development Bank (ADB), according to its Bangladesh Country Operations Business Plan for 2016–2018. In the energy sector, ADB will continue to expand access to and make Bangladesh's power supply more reliable. In the transport sector, ADB will further promote safe, reliable, and fully integrated transport systems that move people and goods more efficiently within the country and across the region. Several key SASEC events during 2015 helped the six member countries promote regional prosperity by improving cross-border connectivity, boosting trade among member countries, and strengthening regional economic cooperation. Here's a review of some of the major events in 2015. Bangladesh's development partner representatives participated in deliberations held at the Bangladesh Development Forum 2015, which shared the country’s needs for infrastructure development. Recommendations to help facilitate growth include good regional connectivity, quality infrastructure development, and increasing participation from the private sector. Asian Development Bank (ADB) Vice President Wencai Zhang pledged ADB's continuous support for Bangladesh's efforts on regional cooperation and integration in a meeting with Bangladesh Prime Minister Sheikh Hasina. He highlighted concrete results of Bangladesh's participation in regional cooperation, and discussed ADB plans to support Bangladesh's transformational infrastructure development. Several initiatives to improve Bangladesh's connectivity with India's North East region are in the pipeline, to increase people-to-people contact and cross-border business. These include revamping trade infrastructures to connect border points, and expanding Bangladesh's diplomatic and consular presence in India's North East region. Bhutan Economic Affairs Minister Lyonpo Norbu Wangchuk and Bangladesh Prime Minister Sheikh Hasina discussed the possibility of exporting hydropower from Bhutan to Bangladesh. According to Minister Wangchuk, Bhutan is interested to supply hydropower to Bangladesh at the lowest possible cost to help meet the country's growing demand for electricity. Bhutan’s Tangsibji Hydro Energy Limited (ThyE) and the State Bank of India (SBI) and EXIM signed a financial agreement costing around $53.5 million for the 118 megawatt Nikachhu hydropower plant. Power generated through the project will boost renewable energy generation in Bhutan, and further expand cross-border power trading in the region. Many people in South Asia still lack access to modern energy services. When these 'energy poor' turn to solid fuel alternatives, they are exposed to high levels of pollution. A commentary on how member countries of SAARC can combat energy poverty and mitigate climate change is shared. A 2-day international conference on energy organized by the Bangladesh Institute of International and Strategic Studies emphasized the need for regional and subregional cooperation to fulfill growing energy needs in South Asia and promote energy security. Former Power Secretary of India, Mr. RV Shahi, underscored how recent efforts in energy cooperation have already started yielding results in the Bangladesh-Bhutan-India-Nepal subregion. Bangladesh Prime Minister Sheikh Hasina and Sri Lanka High Commissioner Yasoja Gunasekera discussed a possible scope of cooperation during a courtesy call paid by the High Commissioner to the Prime Minister in October. Prime Minister Hasina encouraged more Sri Lankan investments and joint ventures in Bangladesh's 22 special economic zones. Bangladesh is also considering introducing a sea route to Sri Lanka. The Second SASEC Bangladesh-India Electrical Grid Interconnection Project will help boost the import of electricity from India to Bangladesh by doubling the capacity of the existing interconnection system. The project is expected to be completed by June 2018. The Asian Development Bank is providing $120 million loan financing; the Government of Bangladesh is allocating $63 million. Bhutan Prime Minister Tshering Tobgay promotedpartnerships as a way to help landlocked developing countries (LLDCs) become land-linked to global opportunities, saying it is possible to ensure a country is not landlocked economically with its neighbors' full trust and confidence. The Prime Minister was attending a high-level forum for landlocked developing countries on the sidelines of the UN General Assembly. The Power Grid Corporation of India began power transmission along its first "Power Transmission Express Highway". With a 6,000-megawatt capacity, this power corridor connects the northern states with the North Eastern Region, and will help both manage the supply of large-scale hydropower and connect power transactions done with Bhutan, Bangladesh, and Nepal. An ADB study has measured the economic and reliability benefits of cross-border electricity trading for countries in South Asia. Findings reveal that power trading in South Asia can not only serve the region's growing demand for energy but also save the region billions of dollars. Recommendations include a market-driven process for cross-border power trading implemented under a regulatory framework across the region. A Cabinet Committee Meeting on Public Purchase of the Government of Bangladesh approved four proposals for ongoing infrastructure projects, including contract awarding upgrade of a 70-kilometer long section of the Dhaka-Northwest corridor from two to four lanes. This road enhancement is being financed under the Bangladesh SASEC Road Connectivity Project. A conference organized by the SAARC Chamber of Commerce and Industry, in collaboration with the Bhutan Chamber of Commerce and Industry, concluded with the Paro Declaration on 25 July 2015 in Bhutan. The Declaration called for free trading of energy-related materials, products, and equipment; freedom of energy transit through pipelines and grids in the region; and urged protection and promotion of foreign investment in energy and an extension of most-favored nation treatment. The Asian Development Bank (ADB) has set three conditions for the $120 million loan that will finance expansion of the Bangladesh-India Electrical Grid Interconnection Project: public notification of tariff regulations, issuing bids for power purchase from India, and written confirmation from the power grid corporation of India for transmission of an additional 500 megawatt of electricity to Bangladesh. The certificate of incorporation for the 660 megawatt Kholongchu Hydropower Project (KHP) was formally handed over to Bhutan's Druk Green Power Corporation and India's Satluj Jal Vidyut Nigam. Officials of KHP expect construction of about 40 kilometers of road leading to the project site to soon commence. KHP is the first joint venture between Bhutan and India. The Nepal Electricity Authority (NEA) is in talks with the Asian Development Bank (ADB) to install solar lights in remote districts where power distribution was severely damaged by the earthquake. Solar power can provide a temporary solution while NEA repairs its distribution channels. A loan and grant financing agreement was signed by the Royal Government of Bhutan and the Asian Development Bank on 4 May 2015 to develop the 118 megawatt Nikachhu hydropower plant. This project will promote regional energy trade between Bhutan and India, and help Bhutan meet its growing demands for electricity. The Government of Bangladesh gave the go signal for two energy projects that will boost the country's capacity to import electricity from India. The two projects, roughly amounting to $204.6 million, will allow the country to import 600 megawatt electricity by boosting the country's transmission capacity and establishing a substation. Regional grid connectivity demonstrates the substantial benefits that come from enhanced regional cooperation. Senior officials of BIMSTEC countries have finalized a draft deal to set up grid connectivity, allowing its seven member countries to share their surplus electricity with each other. The draft deal came out of the 5th Meeting of the BIMSTEC Task Force on Trans-Power Exchange, and provides a broad framework for grid interconnections across the region. It is estimated that the seven BIMSTEC countries have a combined hydropower potential of about 290,000 MW. The 126 megawatt (MW) Dagachhu hydropower plant is now fully commissioned, with the successful run of the second 63MW unit test on 15 March 2015. As a joint venture between Druk Green Power Corporation of Bhutan and the Tata Power Company Limited of India, it has a 25-year power purchase agreement to export power from Bhutan to India. The Asian Development Bank, under the SASEC program, funded its construction through the Green Power Development Project. New Delhi has facilitated an integrated power grid for South Asian Association for Regional Cooperation (SAARC) member states to begin cross-border trading on the Indian Energy Exchange (IEX). The IEX, an automated power-trading exchange, plans to trade 120MW with Bhutan, and 50MW each with Bangladesh and Nepal. This four-nation power trading will hasten the implementation of the SAARC Framework Agreement for Energy Cooperation signed in Kathmandu last year. The Nepal Electricity Authority plans to reduce current system loss to 10% by 2020 through several technical and non-technical measures, including unbundling of development and operation of electricity transmission lines. NEA's total energy generation loss in 2013-2014 stood at 25%. It is currently implementing the Energy Access and Efficiency Improvement Project under the SASEC program. Commissioning of the first unit of the 126 Megawatt (MW) Dagachhu Hydroelectric Project (DHP) officially began at 15:25 on 21 February 2015 with commercial generation of energy from Bhutan to India, coinciding with the 35th birthday of His Majesty the King of Bhutan. Generating capacity during peak season can rise to a maximum of 63 MW. The Green Power Development Project under the SASEC program funded its construction. Asian Development Bank (ADB) President Takehiko Nakao called on Nepal Prime Minister Sushil Koirala on 3 February 2015 during a visit to Nepal, and met with Finance Minister Ram Sharan Mahat and National Planning Commission Vice Chairperson Govinda Pokharel. ADB plans to provide about $1 billion in concessional loans and about $13 million in technical assistance grants to Nepal over the next three years to support faster and more inclusive growth in the country. Asian Development Bank Chief Economist Shang Jin-Wei has put Bangladesh’s potential to grow at 7.3%, above its current average of 6%. Despite its vast infrastructure needs, this makes Bangladesh one of the top 20 global performers in economic expansion. To continue this level of growth, it needs a reliable supply of power to reduce the cost of doing business. The World Bank report “Global Economic Prospects: Having Fiscal Space and Using It,” has set Bhutan's economic growth at 7.9% for the current fiscal year—1.1% higher than the Government's target of 6.8%. Propelling growth, according to the report, is completion of Dagachhu hydropower project. It also estimated growth in South Asia rebounded to an estimated 5.5% in 2014. 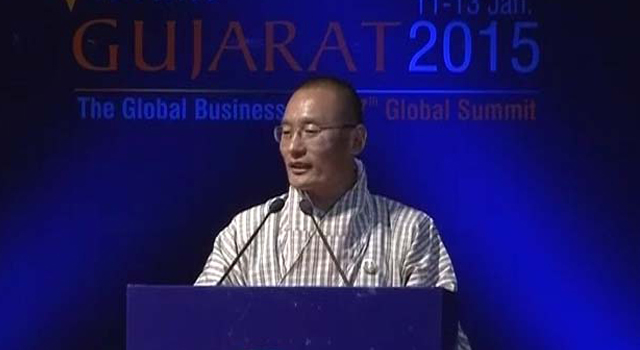 Prime Minister of Bhutan Tshering Tobgay told investors at the 7th Vibrant Gujarat Summit that Bhutan is open to clean, green and sustainable business proposals, including investments in renewable energy and hydropower. He also emphasized that Bhutan gives more value to gross national happiness, and extended an invitation among those interested in doing value-based business to invest in Bhutan. The Asian Development Bank (ADB) approved financing support to develop the Nikachhu hydropower plant—a run-of-the-river hydropower plant—in central Bhutan totaling $120.5 million in a package of loans and grants, through a public-private partnership. Power generated through the project will boost renewable energy generation in Bhutan, and further expand cross-border power trading in the region. The Asian Development Bank, along with other bilateral donors, will fund US$4.5 billion worth of infrastructure and energy-related projects in Bangladesh. The Economic Relations Division of the Bangladesh Ministry of Finance is seeking funding from ADB for four projects, including upgradation of Bheramara HVDC station to import additional 500MW power from India. The 18th South Asian Association for Regional Cooperation (SAARC) Summit concluded on 27 November 2014, adopting the 36-point Kathmandu Declaration, which emphasized enhanced infrastructure connectivity, creation of free trade, implementation of trade facilitation measures, and SAARC project implementation, among others. The Summit launched regional and sub-regional development projects in the agreed areas of cooperation and connectivity. A co-financing agreement for the South Asia Subregional Economic Cooperation (SASEC) Power System Expansion Project was signed by the Asian Development Bank (ADB) and the Norwegian Ministry of Foreign Affairs on 14 November 2014 in Kathmandu, Nepal. The project will improve access to energy in Nepal by increasing electricity access. The Government of Nepal has allocated portions of the $1 billion line of credit from India to infrastructure projects boosting energy trade and transport connectivity between the two countries. The Budhigandaki Hydroelectric Project will receive around half of the credit; bridges enhancing connectivity of Nepal's western border with India are also planned. The South Asia Subregional Economic Cooperation (SASEC) Program has released a mobile app now available for download. This free app is your one-stop shop for the latest information on SASEC Program projects, news, events, and other knowledge products. Nepal and India have formally signed a historic Power Trade Agreement (PTA) which paves the way for free trade of power between the two neighboring countries. The signing took place at Nepal Prime Minister Sushil Koirala's office at Singha Durbar in Kathmandu, Nepal on 21 October 2014, with Nepal Energy Secretary Rajendra Kishore Kshatri and India Power Secretary Pradeep Kumar Sinha in attendance. The Asian Development Bank’s South Asia Subregional Economic Cooperation Program will finance key infrastructure projects worth $492 million under its country operations business plan: the second Bangladesh-India electrical grid interconnection ($105 million), Dohazari-Cox’s Bazar railway link ($217 million), and road and trade facilitation ($170 million). Indian Deputy High Commissioner in Dhaka Mr. Sandeep Chakravorty paid a 3-day visit to India's state of Tripura in October to meet ministers and top officials and review progress made in several India-Bangladesh infrastructure projects. Following his meeting with Power Minister Mr. Manik Dey, Chakravorty revealed that India has initiated steps to ensure 100 megawatt of power will be supplied to Bangladesh from Tripura's Palatana power plant. The Government of Nepal signed the Framework Agreement for Energy+ Cooperation with the Government of Norway, the Government of Denmark, the Asian Development Bank and United Nations Development Program to contribute toward the actual implementation of the Sustainable Energy for All Initiative (SE4ALL). Following the meeting between Indian Prime Minister Narendra Modi and Nepal Prime Minister Sushil Koirala during Prime Minister Modi's state visit to Kathmandu in August, a project that has waited in the pipeline for 17 years saw new developments. The Asian Development Bank held a Regional Energy Trade Workshop at its headquarters in Manila, Philippines on September 8-9, 2014. Mr. Bindu Lohani, ADB Vice President for Knowledge Management and Sustainable Development, delivered the welcoming remarks. Nepal and India signed a landmark preliminary Power Trade Agreement (PTA) on 4 September 2014, around two weeks ahead of the deadline set by India Prime Minister Narendra Modi. This PTA paves the way for bilateral trade of electricity between the two countries, and is foreseen to boost their energy security, as well as bring in added revenues to Nepal's economy. Bhutan’s Prime Minister Tshering Tobgay visited the Asian Development Bank (ADB) on 5 September 2014 to thank the organization for contributing to Bhutan’s development throughout its 30-year partnership. He spoke to the Board of Directors, ADB staff, and the Bhutanese community as part of ADB’s Eminent Speaker Forum, “Bhutan’s Economic Vision: Prosperity for All” and launched the book, “20th by 2020: Bhutan Drive for Improved Governance”. Asian Development Bank President Takehiko Nakao expressed full support for Indian Prime Minister Narendra Modi's vision of greater regional integration and connectivity at a meeting on August 27 during a 2-day visit to India. Strengthening ties with South Asian Association for Regional Cooperation countries is a focus of Prime Minister Modi's government. The Eighth Meeting of the South Asian Association for Regional Cooperation (SAARC) Energy Working Group was held in Colombo, Sri Lanka on 25-26 August 2014 to discuss regional energy cooperation in South Asia. The meeting requested the Asian Development Bank (ADB) to provide technical assistance in the conduct of a regional transmission master plan study, including a detailed scenario on regional power transmission interconnections. Bhutan Prime Minister Mr. Tshering Tobgay and Ms. Lakshmi Venkatachalam, Asian Development Bank (ADB) Vice-President (VP) for Private Sector and Cofinancing Operations, discussed new prospects for mutually inclusive growth, including renewable energy, at a meeting in Thimphu, Bhutan on 21 August 2014. VP Venkatachalam assured Prime Minister Tobgay of ADB's continued support to Bhutan. Economic dynamism in the Asia-Pacific region has been driven primarily by individual economies, yet to ensure sustainable growth in the future, countries must integrate and cooperate to share prosperity, according to the 2014edition of the Economic and Social Survey of Asia and the Pacific. Climate change alters the dynamic of energy security in South Asia with electricity demand projected to grow fourfold by 2030. Climate change adaptation and variability in the region renders most countries vulnerable. Access to energy services affects practically all aspects of sustainable development. Asian Development Bank Vice President Mr. Wencai Zhang met with the Prime Minister of Nepal, Mr. Sushil Koirala on 17 August 2014, and assured him of ADB's commitment to help Nepal achieve its vision of graduating from least-developed country status by 2022. Mr. Gautam Bambawale, recently appointed Ambassador of India to Bhutan, visited Chhukha Hydropower Plant-the first joint project between India and Bhutan-during his first two weeks in office. Power trade between Bhutan and India is one of the many areas of cooperation between the two countries. After striking a similar deal in India, Nepal is set to sign a power trade agreement with Bangladesh. A Memorandum of Understanding is expected to be vetted by Nepal and presented during the power sector cooperation meeting in December, after the South Asia Association for Regional Cooperation summit. Hydropower produced in Nepal through power sector cooperation, would be exported to Bangladesh through India's power corridor. Indian Prime Minister Narendra Modi made a two-day visit to Kathmandu, Nepal on 3-4 August 2014, the first bilateral visit by an Indian Prime Minister in 17 years. At a speech delivered to the Parliament of Nepal, Modi announced India’s desire to help Nepal and offered an additional soft loan of US $1 billion for energy projects and infrastructure development. ADB Board of Directors approved Bhutan’s Country Partnership Strategy (CPS) 2014-2018 to support the country's 11th Five-Year Plan (2013-2018) that focuses on self-reliance and inclusive, green socioeconomic development. Bhutan seeks a more inclusive strategy to broaden its economic base. The new CPS reflects ADB's three strategic pillars of inclusive growth, environmentally sustainable growth, and regional cooperation and integration. The Asian Development Bank (ADB) approved a loan of $180 million to Nepal for the South Asia Subregional Economic Cooperation (SASEC) Power System Expansion Project to help Nepal address its urgent power needs. Two government agencies of Nepal are involved in the project – Nepal Electricity Authority to upgrade transmission and distribution lines, and the Alternative Energy Promotion Centre to provide electricity to remote rural areas. Key energy sector policy makers, regulators and other stakeholders from the South Asian Association for Regional Cooperation (SAARC) member countries gathered on 26-27 June 2014, in Kathmandu, Nepal for the SAARC Energy Centre (SEC) Workshop on Harmonizing Regulations and Policies for Cross Border Power Trade, Risk Sharing and Financial Settlement Issues. Nepal’s Alternative Energy Promotion Centre has installed its first wind-solar hybrid system in Dhaubadi village of Nawalparasi district, with Asian Development Bank support. The clean energy approach of this successful pilot project, already providing energy services to 46 rural households, can be replicated under a proposed SASEC power system expansion project. South Asia’s tremendous growth is leading to large infrastructure gaps that need to be addressed. According to a new report, “Reducing Poverty by Closing South Asia’s Infrastructure”, closing the gap of South Asia’s development goals and its capability to attain these goals needs a $2.5 trillion investment over the next decade. The Asian Development Bank has approved technical assistance of $500,000 for SASEC member countries to develop a comprehensive long-term regional transmission master plan for the region to more effectively coordinate power generation and transmission. The project aims to improve the planning and coordination capacity of SASEC countries to foster cross-border power trading. The SASEC energy working group agreed to conduct feasibility studies for three new priority large-scale cross-border transmission projects worth over $3 billion at a meeting on 9 November 2012 in Thimphu Bhutan. Many countries in the South Asia region face the challenges of energy shortages as they gear up for higher economic growth. The Nodal Officials of the SASEC Program met at the sidelines of the 45th ADB Annual Meeting in Manila on 3 May 2012.